PRINCETON, NJ -- Smoking in the U.S. is highly correlated with religiosity, with those who never attend church almost three times as likely to smoke as those who attend weekly. This relationship holds even when controlling for demographic characteristics associated with smoking and church attendance. 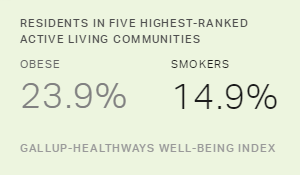 These data are based on 353,571 interviews conducted throughout 2012 with American adults aged 18 and older as part of the Gallup-Healthways Well-Being Index. Smoking as measured by the question "Do you smoke?" increases in a linear fashion as church attendance decreases, ranging from a low of 12% among those who report attending church at least once a week, to 30% among those who never attend church. 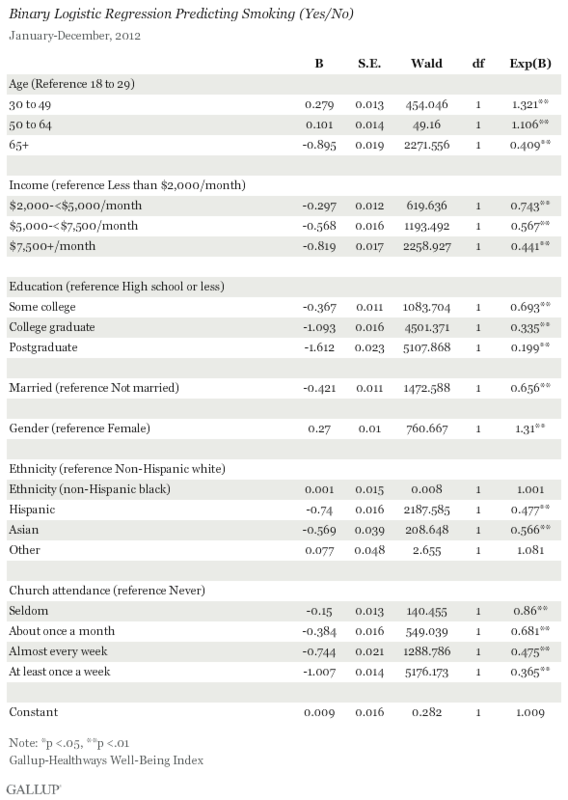 The fact that religiosity remains a significant predictor of smoking after controlling for these other demographic correlates confirms the strength of the relationship, but doesn't establish causality. It is possible that the act of smoking in some way causes people to be less religious. This could occur, for example, if smokers are ostracized or less welcome in religious settings. It is also possible that an additional factor such as mental state or an addictive personality causes certain individuals to be more likely to smoke while at the same time causing them to be less religious. It is also possible that the relationship is straightforward: Something about frequent church attendance could in turn cause people to be less likely to smoke. One explanation for this could center on religious doctrine and training. A number of religions have formal or informal constraints on smoking, and presumably those who are most adherent to those religions, as measured by church attendance, would be less likely to smoke. The Church of Jesus Christ of Latter-day Saints or Mormon faith provides an example. Mormon doctrine prohibits smoking, and although about 8% of Americans who identify as Mormons smoke regardless, this smoking rate is less than half of the 20% found for the general adult population in 2012. This suggests that Mormon doctrine does have an effect on smoking among LDS members. Mormons are also significantly more likely to attend church on a weekly basis than any of these other religious groups. The smoking rate among Jewish Americans is almost as low as that of Mormons, and while some Jewish scholars argue that rabbinic law forbids smoking, this is not an official part of Jewish theological doctrine. 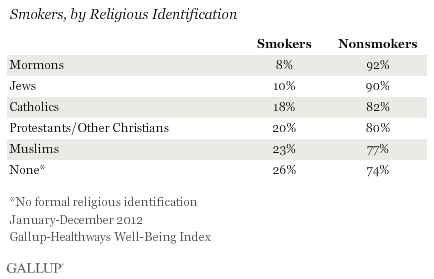 The smoking rate is highest among Americans who have no formal religious identity. Protestants, the largest religious group in America, smoke at the national average rate, while Muslims smoke at slightly above the national average and Catholics at slightly below it. Official doctrine or unofficial normative views on smoking vary across the large and diverse set of denominations that constitute Protestantism, making it impossible to isolate an overarching Protestant doctrine on smoking, although conservative or evangelical Protestant faiths such as the Southern Baptists have culturally frowned on smoking. The Gallup-Healthways Well-Being Index dataset does not include identification by religious denomination, and thus does not allow for analysis of smoking by this variable. More generally, the impact of religiosity on likelihood to smoke, as measured by church attendance, extends across each religious group for the most part, although the pattern is less straightforward among Jewish Americans. Those within each major religious group who attend religious services weekly are less likely to smoke than those who never attend. Thus, even if the theology or normative structure of particular religions has some impact on one's likelihood to smoke, one's relative religiosity as measured by church attendance -- regardless of religion -- continues to have a significant impact. Gallup research has shown that smoking is generally related to a whole host of negative emotions. Smokers have worse emotional health than nonsmokers, experience more stress, worry, depression, anger, and sadness, and are less likely to experience positive emotions. At the same time, Gallup research has shown that religiosity is itself associated with positive well-being measures. Thus, the connection between smoking and being less religious follows a predicted pattern. Being highly religious and not smoking are characteristics associated with higher well-being, while being nonreligious and smoking are associated with lower well-being. It is difficult to determine causality in these relationships. While one hypothesis might be that becoming more religious would lead to a cessation of smoking and an increase in well-being, this can't be proven. It may be that stopping smoking first could in turn cause one to become more religious and have higher well-being. Or, it could be that entering into therapy and thus increasing one's well-being could lead to a cessation in smoking and to an active effort to seek out religion. One benefit of studying the relationship between smoking and other lifestyle and demographic variables is the ability to use the results to find ways to help Americans stop smoking. Most smokers would like to stop smoking, and the fact that smokers in the U.S. report that they have attempted to stop an average of 3.6 times shows just how hard this is to do. Further research is needed to tease out the psychological and social mechanisms that underlie the significant correlations among religiosity, smoking, and well-being. Results for this Gallup poll are based on telephone interviews conducted Jan. 2-Dec. 30, 2012, on the Gallup Daily tracking survey, with a random sample of 353,571 adults, aged 18 and older, living in all 50 U.S. states and the District of Columbia. For results based on subsamples of the population based on religious attendance and religious identification, the margin of sampling error will be larger, depending on sample sizes.